1 of 5 Place oil in a 4- to 6-quart stovetop-safe slow-cooker bowl over medium-high heat on stovetop. Cook carrot, celery and onion for 7 minutes or until softened. 2 of 5 Transfer to slow-cooker base and add potatoes to bowl. Pour broth over top and add bay leaf, dried thyme and paprika. Cover and cook on HIGH for 1-1/2 hours or LOW for 3 hours, or until potatoes are cooked through. 3 of 5 Stir in corn and milk; cover and cook for 1 hour or until heated through. 4 of 5 In a small bowl, stir together cornstarch and wine and whisk into soup; cook an additional 10 minutes. Stir in fresh thyme and salt. 5 of 5 Using a potato masher, gently mash the soup until slightly thickened. 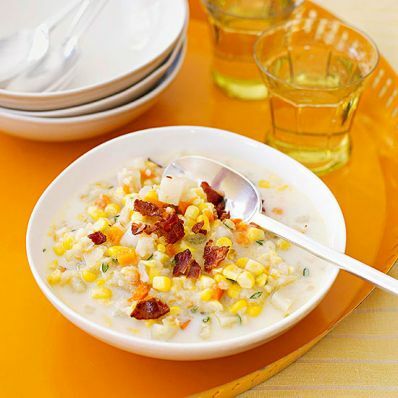 Sprinkle each serving with a generous 1/2 tablespoon crumbled bacon and serve immediately.